To make a communication with Database a connection must be made. 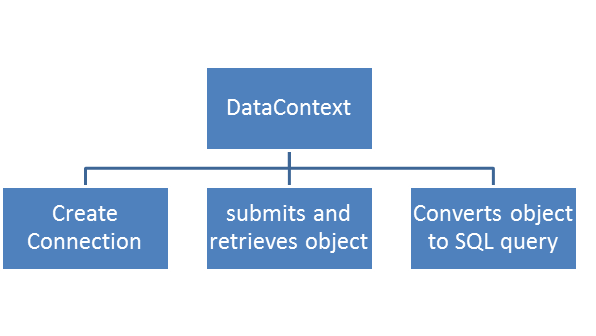 In LINQ this connection is created by DataContext. It submits and retrieves object to database. You can say, it acts as exactly the same as SqlConnection class and perform some extra tasks as well like conversion of object to SQL query. DataContext class is having four types of overloaded constructor. Inherits the class from DataContext class. Advantage of using strongly typed data context is that each table is available in Table collections. So you do not need to fetch tables using GetTable method.